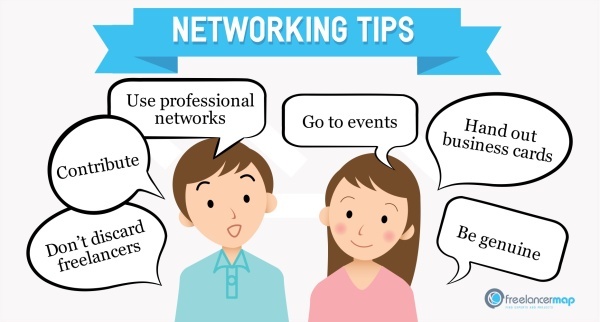 Networking: a simple enough word, which strangely causes many freelancers to get nervous just by hearing it. Whether it is the “oh, not this again” reaction or the fear of not being able to express the best sides of your business in a couple of breaths, networking can be frustrating. But it’s extremely important. A general tip that applies to both online and offline networking is not leaving other freelancers out. Connections with companies and potential big clients might seem more productive and lucrative, but hanging out with the freelancer crowd can prove to be just as effective. Think of it as having good, reliable colleagues. If the workload is too much, the project too big or just too difficult, freelancers need others that they can count on. Make yourself be that other person. To start with online marketing in particular, one aspect is rarely mentioned. Contributing to online forums, commenting on articles and writing blog pieces can boost your career immensely. All you have to do is discuss the very thing your career is built around. Many people stumble upon such content and whether they are looking for your services or recommend you to others, the potential is definitely there. Professional networks like LinkedIn or Xing are often only used when looking for a job. Firstly, that is a big misunderstanding of what are supposed to do. They are one of the best platforms for networking online. Keep your profile up to date and include projects you’re working on, but also actively look for people who work on similar things. Secondly, you are a freelancer and that means that you are almost always, actively or passively, looking for new opportunities – don’t let them slip by. Offline marketing should not be disregarded either. Although you can reach an incredible amount of people over the internet, meeting them face to face is a whole other world that you can be a part of. From small talk to heated discussions – every small conversation can lead to something big. Some say business cards are a thing of the past. I say you’re not using them right if you think that’s the case. Yes, many of your cards will land in a bin or stuck in a wallet never to be looked at again. But it’s a small investment that plays off of people’s forgetfulness. A name can be difficult to remember, even you know that person made a stellar impression. A business card with your name, website and field of work will make sure that impression not only gets remembered, but also linked to the information needed for following up. Last but not least, don’t always think about what kind of a job your networking efforts are going to land you. Focus on presenting yourself, but also listening to others. Don’t be too pushy with selling yourself. In short, lead a normal conversation like you would with people you met at a bar, just let it be about your work. Genuine passion about your work is the most important aspect that potential clients are going to remember when considering you for a job in the future. How do you network? Share your ideas and tips in the comments!